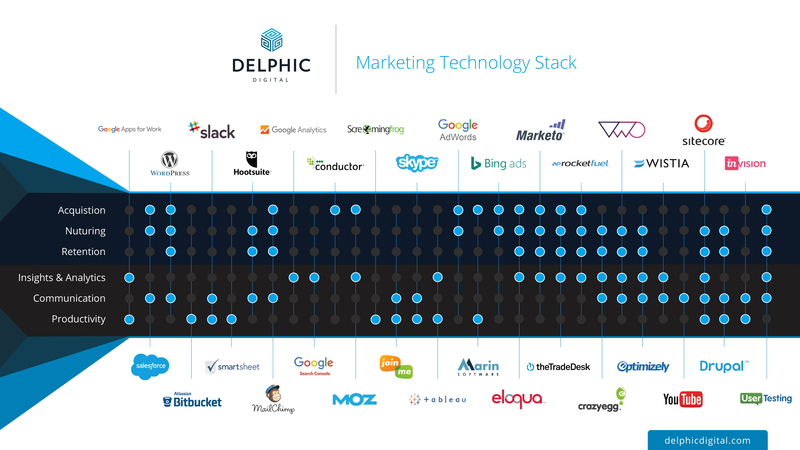 What is a Marketing Technology Stack? Definitions, Stats and Examples. It’s likely you’ve heard the term “marketing technology stack” referenced as a marketing trend lately – but the question that remains for many is: Um…what exactly is it? And, how do I set it up? In this post, we’ll not only answer that question, but also take a look at why marketers are investing more in the stack, and look at common frameworks and examples to get you going. 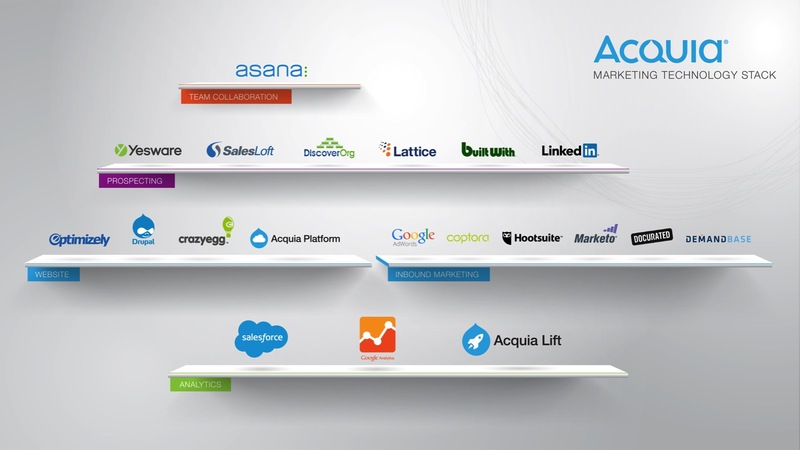 To explain it simply, a marketing technology stack is a group of technology-based tools (think SaaS platforms, traditional software, social media tools, etc.) that marketers use to efficiently and effectively execute marketing activities, across a numbers of channels. Depending on the size and needs of the business, marketing technology stacks can come in different types, including many tools, across a large number of departments. Because of the value it can provide, The martech space is in the midst of an exponential growth curve. 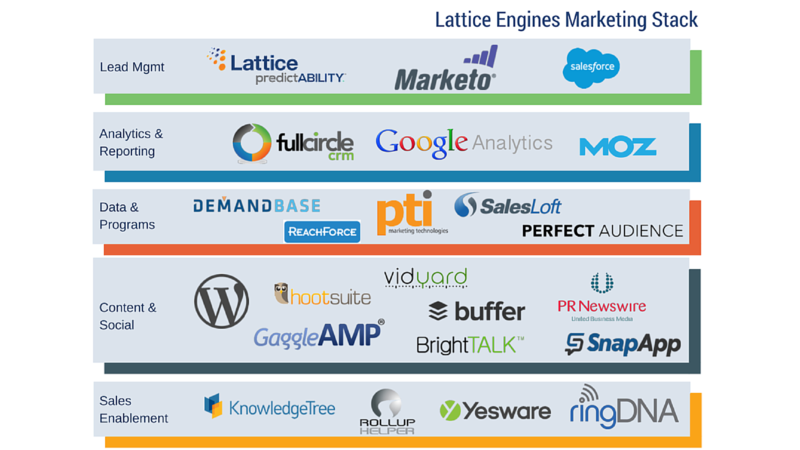 The sheer breadth of channels, and number of marketing technology vendors is mind-boggling. Data from MarketingLand shows that in 2011, there were about 150 companies geared toward marketing technology. In 2016, there are almost 4,000, with investment in marketing technology expected to see a compound annual growth rate (CAGR) of 12.4%. Add to this the fact that Gartner predicts marketing technology budgets will exceed IT budgets by 2017, and it’s clear that this is no trend – technology stacks are here to stay. Why? Because martech helps marketers evolve with the changing needs of the customer. The tools within the stack are helping marketers get the right message in front of the right customers – at the right time. Long gone are the days of “one size fits all” promotional messaging – the modern marketer needs a stack of tools to deliver personalized, contextual content to new customers, converting leads, and helping companies overall bottom lines. That means better ROI, and a happier C-suite. 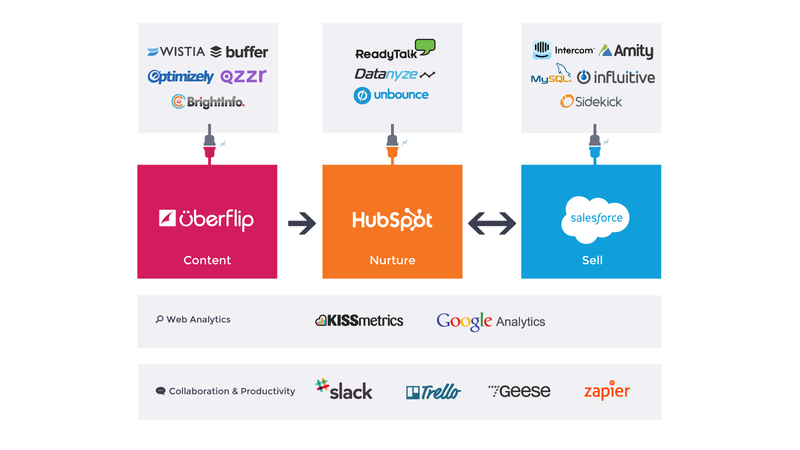 Check out our post 47 Tools and Resources to Build a Ridiculously Powerful Content Tech Stack. If you need to express the importance of a strong marketing technology stack, pull a few of the statistics below, and share them with your leadership team. What do the stats mean for marketers? There are a few key conclusions we can draw from the stats outlined here that marketers need to know, understand, and communicate with leadership. 1. 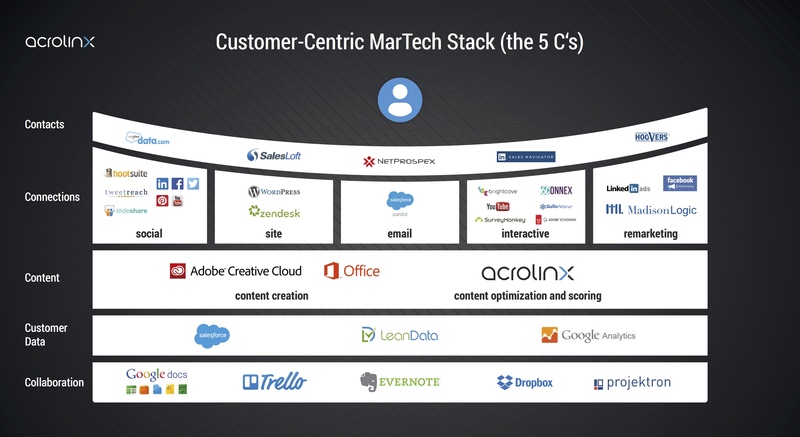 The marketing technology stack is not a trend – it’s here to stay. For those who still haven’t tapped into all it can offer, now is the time. As competitors are already improving their efficiency (thanks to their martech stacks), those who continue to wait will only fall behind. Conversations about how you’ll approach (and spend) on a marketing technology stack need to start today. Each company’s marketing stack should be different, and structured to meet the company’s unique needs and objectives. Before diving in and purchasing components of a stack, think about which tools will help you accomplish your goals, and then build your stack with resources that can help you reach them. 3. Data is for sharing. Once a marketing technology stack is in place, insights provided by it need to be shared beyond the marketing department. From sales to customer service to business development – the numbers and stats produced from the stack are valuable. Don’t depend on the technology alone – put it to work for different departments so the overall customer experience can be improved. Ok – so we know marketing technology is here to stay, and is going to become even more critical to moving forward in the marketplace. 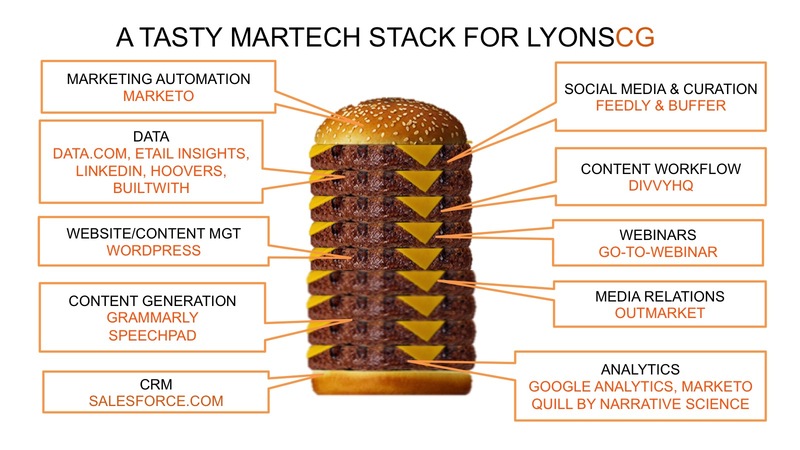 Let’s first look at some of the common layers that make up most martech stacks. The type of business you run will dictate the different technologies you use, and how you organize them in the stack. The biggest variable is whether you you sell products/services in a B2C or B2B market. Each business type will use different channels and technologies to acquire, convert, and retain customers. 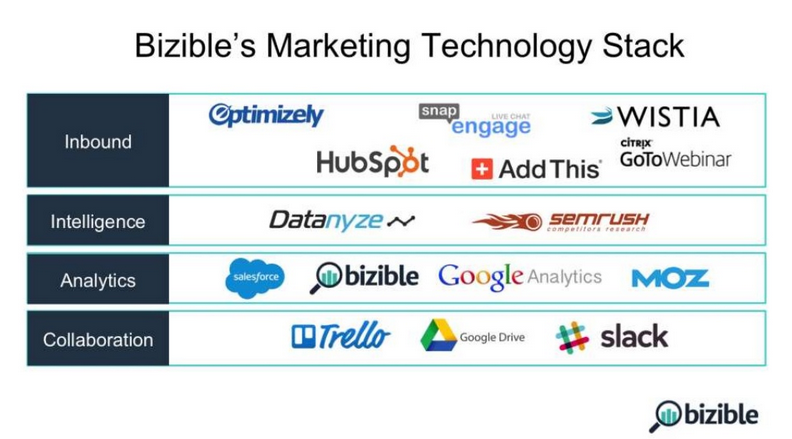 That said, when building out a marketing technology stack there are a set of foundational technologies you should always consider. The idea is that each one will serve a critical purpose to the efficient operation of your business, at each stage of the sales pipeline. Some technologies can span multiple layers of the technology stack. Content Management System (CMS) – this technology with drive your website, blog and other web properties used to market your business online. A common example is WordPress, which now powers over 30% of the internet. Content Management System’s are popular because they make it easier for non-technical team members to log into a website and make quick changes to key marketing materials, without having to mess with any code. Advertising Technology – this will be a critical component of the customer acquisition efforts for most companies. Most technologies in this area will drive search engine marketing, retargeting, display ads, social PPC and campaign tracking. While there are hundreds of different technologies that fall in this category, the most common ones will include platforms like Google AdWords, Bing Ads, AdRoll and facebook Power Editor. Conversion Technology – these tools are used to convert traffic into leads and customers. Common options include platforms like unbounce (quickly build high-converting campaign landing pages with zero coding) and Crazy Egg (track on-site behavior to identify conversion leads). Email – with an average ROI of 40:1, this is one of the most critical communication channels for any business. However, the level of complexity will vary from business to business. While some organizations may require a robust solution like Infusionsoft, others may be fine using something like Mailchimp. Social Media – this includes technology to accelerate audience growth, monitor activity and engagement, automate content distribution and measure channel performance. While third party platforms like buffer and Hoostsuite allow you to accomplish most of this, many companies also leverage native ad platforms on channels like facebook, Twitter and LinkedIn to launch, manage and measure social PPC campaigns. Search Engine Optimization (SEO) – a strategy most companies use to drive organic (unpaid) traffic to a website. SEO will be tightly integrated with your broader content marketing strategy. There are a lot of tools available to help with keyword research, content analysis, link and citation building, keyword tracking and other SEO initiatives. Prospecting and Outreach Technology – supports both inbound and outbound marketing campaigns. These technologies allow marketing teams to quickly find, qualify and reach out to marketing and sales leads. Automation Software – this technology helps organizations streamline sales and marketing by replacing tedious, time-wasting activities with automated solutions. 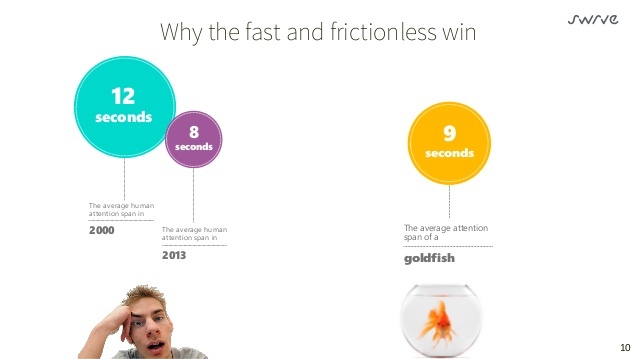 Interactive Content – content marketing is more competitive than ever. Millions of blog posts are published every day, and it’s becoming harder to break through the noise. Interactive content platforms allow companies to create interactive assets – infographics, videos, whitepapers, brackets – that better engage your audience, and generate higher quality leads. Web Analytics – critical to measuring the performance of all marketing and sales activities, and providing data-driven direction to all ongoing efforts. The most common example is Google Analytics. Collaboration – this technology helps teams communicate and manage projects more efficiently. Common examples include Slack, Trello, Asana and Jira. Marketing technology stacks comes in all types, shapes and sizes. The most important thing is to select the stack that works for you. 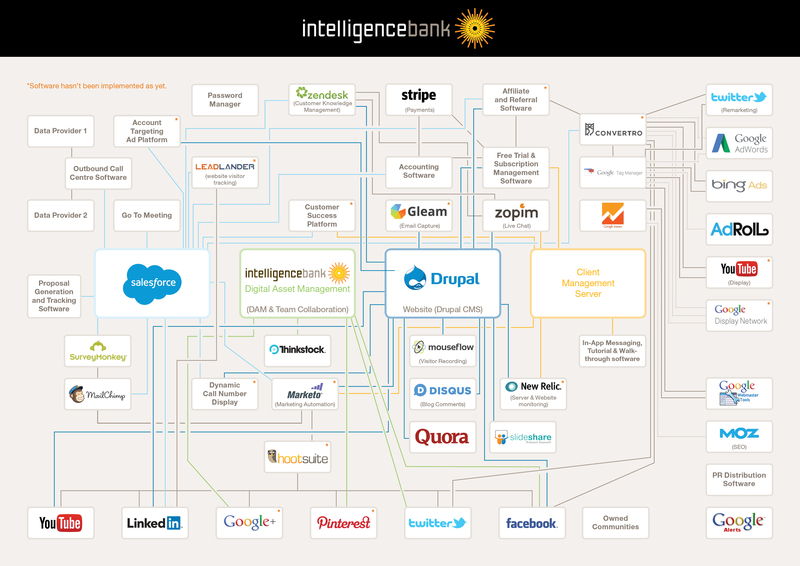 To help you visualize what a marketing technology stack might look like in your organization, we’ve included several different examples below. Some are very simple, while others are much more complex. Technologies are assigned to different stages in the buyer journey – awareness, acquisition, conversion, retention, advocacy, data collection and analysis. Example: Datapipe. The name says it all. Each component of the technology is connected around data flow, clearly showing the different relationships between each one. Example: Intelligence Bank. In this stack, the platforms are the base, with other applications “plugged” in from the top. Usually, the applications that are layered on top provide additional components and functionality to support special role-based activities. Example: Uberflip. Technologies are clustered around function – content, social, lead generation, email – or marketing/sales activity – prospecting, nurturing, marketing automation. Example: Lattice Engines. Those are 4 common marketing technology stack frameworks you can model in your business. But, let’s not stop the inspiration there. 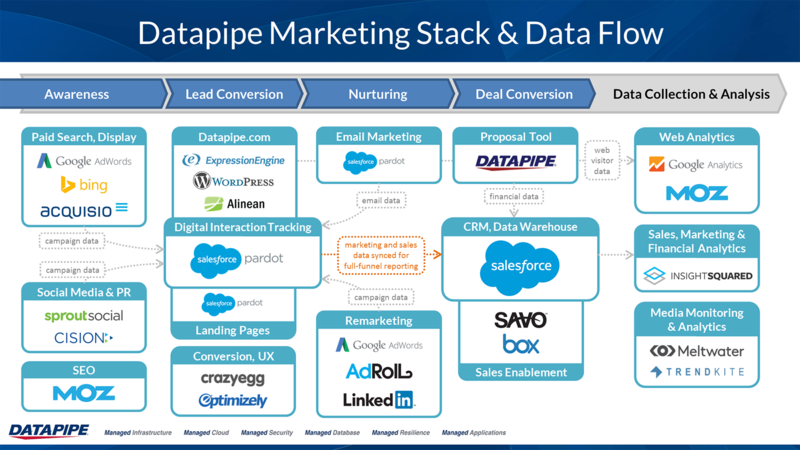 This is another clean example of role based marketing technology stack. Each platform or application is neatly organized into the appropriate category. There is an implied pyramid structure, with a unique callout of the “prospecting” role to cleverly show the intersection of marketing and sales. 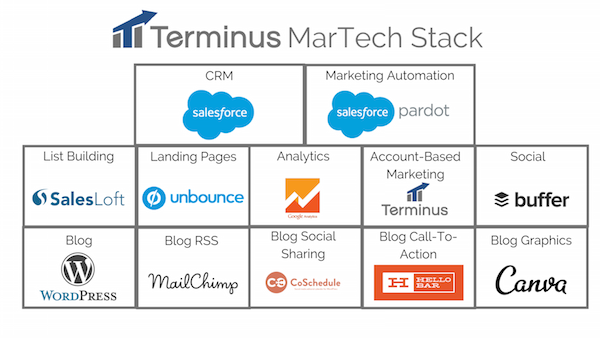 B2B marketing platform Terminus has built a marketing technology stack from different blocks. The functions of their different tools are clear here, and it appears that all of the data they provide tie-in seamlessly with both their CRM and Marketing Automation via Salesforce. The 5 C’s model – Collaboration, Customer Data, Content, Connections, Contacts – provides a great bottom-up view of the company’s technology stack. This matrix view of the stack gives a great two-dimensional view. On one hand, you can see which technologies align with each marketing capability, and quickly appreciate the cross-functional nature of the modern marketing stack. That is, most platforms now serve multiple different purposes. Unless you’re a wizard or you’ve learned how to clone yourself, you need a team in place to handle the different tools within the stack. There are many different moving parts, so delegating different aspects to departments under the umbrellas of marketing, customer service, and business development is one of the most common ways teams are managing their stacks. When these different teams come together and share information provided by their handy marketing stack, they can make better, more informed decisions about efforts moving forward – and can devote financial and time resources to the activities that are producing the best results. Content marketing has been adopted by 85% of B2B marketers, with companies spending more than $120B on it last year. Needless to say, it’s a foundational layer in any marketing technology stack. But, there is one BIG problem. Most of the content brands publish today is text heavy – ebooks, long form blog posts, whitepapers, guides etc. While there is still inherent value in producing and distributing these assets, the truth is, the attention span of your audience is getting shorter. And, therein lies the opportunity. In order to cut through the noise, you need to produce content that better engages your audience. How do you do this? Interactive content is dynamic because it starts a conversation with the audience and speaks to their innate competitive nature and/or willingness to share their opinions. It’s value-packed, and produces immediate, tailored results they care about. You can go as far as saying that it’s like stuffing a sales development rep into a piece of content. There is a reason why 93% of marketers agreed that interactive content is effective in educating it’s buyers, and why 88% mentioned it was effective in differentiating their brand from the competition.